From horses to monkee...and back! He's a pop icon from the sixties, a member of the first 'boy band' .. and Davy Jones of The Monkees owes it all to a former racehorse trainer. Were it not Newmarket handler Basil Foster, we may never have heard smash hits 'Daydream Believer' and 'Last Train To Clarksville'. Because Mancunian Jones was urged by Foster to give up on his burgeoning career as a jockey to take a tilt at stardom. Advertisement >>Yet, despite his amazing stage and screen success, Jones still hankers for what might have been. "My father used to take me to Manchester Racecourse in the early Sixties and suggested that when I left school, because I didn't have the height, the size or capacity to do a carpentry or plumbing apprenticeship, I should try racing," he said. "We actually contacted the Manchester Evening News, who put us in touch with Basil Foster in Newmarket." By then, Jones's acting talent had already begun to blossom. He'd briefly appeared in a 1961 episode of Coronation Street. Yet it was furlongs rather than footlights that captivated him. "Basil contacted me and I spent six weeks at Holland House Stables. Then I left school in December '61, earlier than I should have, and went to work for him as an apprentice. "I was galloping up Warren Hill after only a few weeks and loving every minute of it. Being a cocky kid, I even went into the stable lads boxing championship. I got a good walloping from Taffy Thomas - that was an awakening! "After four or five months, a theatrical agent who knew Basil spent the day with us. Basil mentioned that I had been in showbusiness, that I had confidence and spent all day cracking jokes and doing shtick." Jones obviously created an impression. A few days later the agent contacted Foster and told him that a London show was looking for someone to play the Artful Dodger in a production of Oliver! The trainer suggested Jones should try for the part. "Actually, he insisted," said Jones. "I just cried. I wanted to be a jockey. But he said 'You're going! Come back when you're famous'." Oliver was a hit. It soon transferred to Broadway and Jones was on his way to super-stardom. In 1966 The Monkees were created by music executives looking to launch an act on American TV. Dubbed the 'Pre-Fab Four', The Monkees - Peter Tork, Mickey Dolenz, Michael Nesmith and Jones - became the biggest pop act on the planet - selling 50million records and having the highest-rated TV show in America and Europe. In 1967 they outsold The Beatles and the Rolling Stones combined. Jones, now 65, never lost touch with Foster, who went on to train in Canada and Florida. "He was like a second father to me. He's in his 80s now. I've always confided in him and tried to do right by him." Between 1966 and 1970, The Monkees released 121 songs on nine albums. Then as quickly as it begun, it was over. Jones still has regrets. He admitted: "I made one huge mistake. When The Monkees finished, I should have got away from Hollywood and got back into the racing game. Instead I waited another 10 years." Jones purchased Grenville Hall, near Portsmouth, and built a facility with 32 boxes to keep horses. He eventually took out an amateur's licence. "I achieved my super goal in 1996!" He refers to Digpast, a 4,000 guineas purchase, who was trained in Bognor by Roland O'Sullivan and owned by his daughter Sarah. 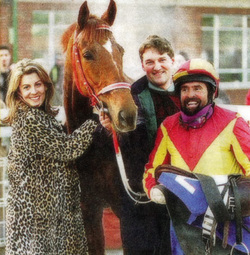 Jones had worked with the horse for fully six months before he turned up in the Ontario Amateur Riders' Handicap at Lingfield at 4.20pm on February 1, 1996. Mr Davy Jones, claiming 5lb and sporting a beard, started slowly on the hard-pulling six-year-old, but he made good headway from four furlongs out and went clear from two out to record a two-and-a-halflength victory. "It was a dream and I was fortunate enough to realise that dream," he said. Jones, along with Dolenz and Tork, are currently on the American leg of their hugely successful Monkees 45th Anniversary Tour. He is also penning a musical "which should be ready in the next couple of years" and he's turning his local old church in Beavertown, Pennsylvania, "into a memorabilia museum and children's theatre". Jones and his new wife, Jessica Pacheco, have 11 horses and while entertainment will remain his first love, riding and racing is a passionate mistress. "I'd love to race one of my own horses in England. One is a beautiful chestnut colt called Bazfoster, named after Basil. "We hope to get a race into him before the end of the season at Gulfstream Park, but I'd love to ship him to England, box him up and run him at Newbury or Cheltenham, just so people can remember Basil Foster. Wouldn't that be great?"